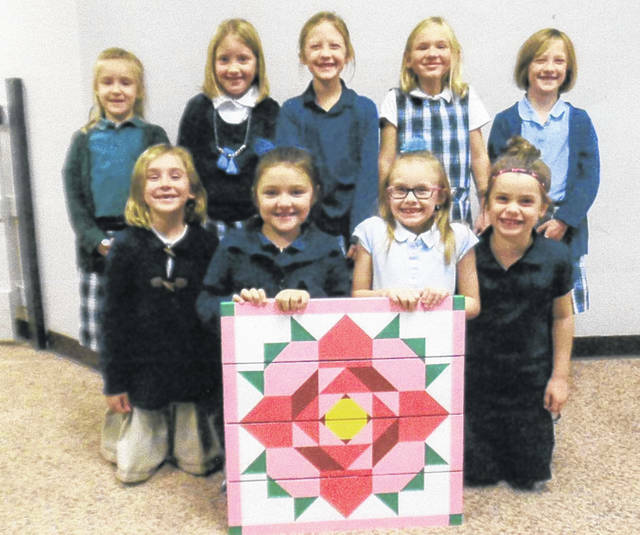 This barn quilt was painted by the first graders at Fayette Christian School; it is one of many class projects that will be on the auction block at the Fayette Christian School biennial auction. The auction will be held Saturday, March 16 and will be held at the Fayette County Fairgrounds’ Mahan Building. Doors open at 9 a.m. and the auction begins at 10. Donations are currently being accepted, for donation information contact the school office at (740) 335-7262 or CC Bumpus at (614) 679-5089.
https://www.recordherald.com/wp-content/uploads/sites/27/2019/02/web1_img095.jpgThis barn quilt was painted by the first graders at Fayette Christian School; it is one of many class projects that will be on the auction block at the Fayette Christian School biennial auction. The auction will be held Saturday, March 16 and will be held at the Fayette County Fairgrounds’ Mahan Building. Doors open at 9 a.m. and the auction begins at 10. Donations are currently being accepted, for donation information contact the school office at (740) 335-7262 or CC Bumpus at (614) 679-5089.